In this column, Christian Guillermet Fernández* and David Fernández Puyana* describe the background to negotiations on a United Nations declaration on the right to peace. GENEVA, Apr 18 2015 (IPS) - The international community will have a great opportunity to jointly advance on the world peace agenda when a United Nations working group established to negotiate a draft U.N. resolution on the right to peace meets from Apr. 20 to 24 in Geneva. In July 2012, the Human Rights Council (HRC) of the United Nations adopted resolution 20/15 on the “promotion of the right to peace” and established the open-ended working group to progressively negotiate a draft United Nations declaration on the right to peace. High on the agenda of the working group has been giving a voice to victims of war and conflict. Chaired by Ambassador Christian Guillermet, Deputy Permanent Representative of Costa Rica to the United Nations in Geneva, the working group has been conducting informal consultations with governments, regional groups and relevant stakeholders to prepare a revised text on the right to peace. the principles of the Charter of the United Nations, such as the peaceful settlement of disputes, international cooperation and the self-determination of peoples. elimination of the threat of war. the three pillars of the United Nations – peace and security, human rights and development. eradication of poverty and promotion of sustained economic growth, sustainable development and global prosperity for all. the wide diffusion and promotion of education on peace. strengthening of the Declaration and Programme of Action on a Culture of Peace. The draft Declaration on the right to peace solemnly invites all stakeholders to guide themselves in their activities by recognising the supreme importance of practising tolerance, dialogue, cooperation and solidarity among all human beings, peoples and nations of the world as a means to promote peace through the realisation of all human rights and fundamental freedoms, in particular the right to life and dignity. To that end, it recognises that present generations should ensure that both they and future generations learn to live together in peace and brotherhood with the highest aspiration of sparing future generations the scourge of war and ensuring the maintenance and perpetuation of humankind. The main actors on which the responsibility rests to make reality this highest and noble aspiration of humankind are human beings, states, United Nations specialised agencies, international organisations and civil society. They are the main competent actors to promote peace, dialogue and brotherhood in the world. It follows that everyone should be entitled to enjoy peace and security, human rights and development. In this case, entitlement is used to refer to the guarantee of access of every human being to the benefits derived from the three U.N. pillars – peace and security, human rights and development. This draft Declaration could not have been achieved without the extensive cooperation and valuable advice received in recent years from academia and civil society. In fact, this process has involved consultations with prestigious professors of international law from over ten universities and research centres. In particular, the Chairperson-Rapporteur has written papers – some of which will be published in the near future – in cooperation with other experts in prestigious journals of international relations and law on the different aspects on peace. He has also contributed to the Research Guide on Peace recently prepared by the Library of the United Nations in Geneva. Since the beginning of the negotiation process, the working group has based its approach on the TICO approach – transparency (T), inclusiveness (I), consensual decision-making (C) and objectivity (O) – and a little realism. Consensus is a process of non-violent conflict resolution in which everyone works together to make the best possible decision for the group. Consensus is the tendency not only in international relations, but the United Nations. For important issues affecting the life of millions of people, the United Nations, including its multiple entities and bodies, works on the basis of multilateralism with the purpose of reaching important consensual decisions. * Christian Guillermet Fernández is Deputy Permanent Representative of Costa Rica to the United Nations in Geneva and Chairperson/Rapporteur of the Working Group on the Right to Peace. 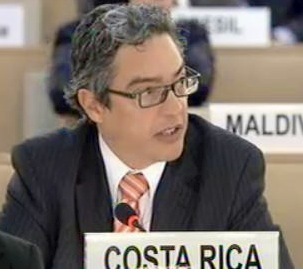 * David Fernández Puyana is Legal Assistant of the Chairperson/Rapporteur, Permanent Mission of Costa Rica in Geneva.